"You either have one... Or you Don't!" For more about Brooks Mason Click HERE! that was shown at the end of the Welcome/Rules Meeting this year. As many found out at this years IKF World Classic, Shrader Media was in the house filming all the fights. Here are a few Photos from the 2012 IKF World Classic. More Added soon with the weekends FULL RESULTS! Save time and download this form and fill it out, before you leave home, fill it out and have it done before you arrive. PRESENT YOUR "COMPLETED" AMATEUR CONFIRMATION FORM. Fighters within 50 miles of Hotel do not have to show proof of hotel room, BUT DO HAVE TO PRESENT ID SHOWING HOME ADDRESS. If you have a LATE FEE DUE or NEED A PHOTO by your registration listing on the registered fighters or trainers listing, you will need to go to the PHOTO BOOTH FIRST. We need your photo for your ID PASS. NOTE: FIGHTERS - Once you attain your fighter pass, you must now attain "THREE" PASS Stickers that will be placed on your fighter pass. PRESENTED FULL FIGHTER PHYSICAL TO EVENT MEDICAL STAFF. PAST YOUR PRE-EVENT PHYSICAL AT REGISTRATIONS. If you are missing ANY of these THREE PASS STICKERS you will NOT be able to Fight. "BE PROFESSIONAL" and make your weight. We will begin weighing fighters in at 1:00 PM on Friday. Make sure you have your physical done after you weigh-in. Go to the medical area directly after you weigh-in. You need to attend the rules meeting which will immediately follow weigh-ins at 6:15 PM SHARP. IF YOU DO NOT MAKE WEIGHT FOR YOUR DIVISION YOU WILL BE DISQUALIFIED FROM THE TOURNAMENT. TO VIEW ALL WEIGHT DIVISIONS CLICK HERE. A fighter who is greater than two pounds over their division weight limit will be disqualified without further recourse. The maximum amount of weight a fighter will be allowed to lose after their first Official Weigh-In is 2 pounds in 2 hours! NO FIGHTER CAN "GAIN" WEIGHT TO MAKE WEIGHT after he/she first weighs-in. If the fighter fails to make the weight limit of their division, said fighter is disqualified. If you do not have this done, there is a $50 Fee Paid to the IKF to do this for you at Registrations. EVERYONE will take an additional PRE-EVENT PHYSICAL. You can download this form by clicking HERE so that you can have the top portion filled out before you get to the medical station. Be prepared to take a "Pregnancy Test" which is a requirement of the Florida State Athletic Commission. The IKF will pay for the cost of the test kit. FEMALE FIGHTERS under the age of 18 are not required to take a Pregnancy Test. FIGHTERS: If after July 6th at 12 noon the WORDS "NEED PHOTO" are listed after your name in the registered Fighters Brackets, you failed to get your photo to us by the July 6th, 12 noon Deadline. This means you will be charged a $35 Photo Fee at Registrations, even if you bring your own photo. TRAINERS: As noted on the Trainers Registration Page if you have not sent in your Trainers Registration Form you will be paying $50 Photo Fee at Registration whether you have a photo of yourself or not. LATE FEES: FIGHTERS, If after July 6th, 12 noon the WORDS "LATE FEE $$" are listed after your name in the registered Fighters Brackets, you owe the noted LATE FEE and this must be paid BEFORE YOU ATTAIN YOUR FIGHTER ID PASS. Once you have completed all of the above and you have THREE PASS STICKERS on your ID Pass, Please collect your free Gifts at this years FIGHT MALL! The FIGHT MALL is where all the Vendor Booths will be this year which is by the *front doors of the venue. TraditionZ: Gift certificates of $10.00 towards the purchase of any TraditionZ shirt at the event or thru the website later. LOOK FOR THE SPECIAL "WC FIGHTER GIFT" SIGN AT THE BOOTHS WITH FREE GIFTS! (*) Some of these booths may move to a different location for Saturday and Sunday of the event. This meeting is MANDATORY For ALL FIGHTERS! Here are all the booths you will find in the FIGHT MALL! Brainpad has been a part of the IKF World Classic Tournaments since 2000 when the company was called WIPPS. They will be giving a FREE Brainpad Mouthguard to every Fighter at Registrations. FIGHTERS INC. Is a Gear and Equipment Company. Along with having fight gear at their booth, they will also be supplying one of the Fight Rings at this years IKF World Classic. Although they won't have a booth at this years IKF World Classic, they are VERY MUCH a part of this event as the IKF's selected Insurance provider for *Fighter and Venue Insurance! (*) Did you know that the IKF World Classic Tournament is the ONLY Muay Thai / Kickboxing Tournament that covers all the Tournament Fighters with Medical Insurance? Foster Graphics also created and produced the IKF World Classic Tournament Programs, Award Certificates as well as the IKF World Classic Tournament Logos you will see on all the event merchandise. For more on Foster Graphics, see Toni at the IKF Booth this weekend! Glenn is the Official Photographer of the IKF World Classic. He will be doing all the photos for all the fighter's throughout the Tournament. For photos of past IKF World Classic Events visit Glenn's Website! From event Tournament T's to Hats & Beanies, the IKF Merchandise booth is sure to have all kinds of IKF Apparel.IKF Hats, T's, Sweatshirts, License Plate Frames, Special Kids & Women's apparel, and much, much MORE! The IKF of course is the host and sponsor of the World Classic Tournament and all needed Tournament information can be attained their as well. This will also be the event ticket booth and location to purchase event Video Passes. In addition, all IKF PKB participants will register at the IKF Booth as well. 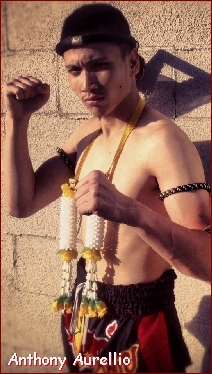 Muay Thai Addict caters to all things Muay Thai (gloves, shin guards, hats, shirts, mouth pieces, etc.) with their primary focus on custom Muay Thai shorts. Muay Thai Addict is a company that is passionate about all things having to do with Muay Thai. With ongoing developments in apparel and gear, we are up for the challenge with a mission to bring you the highest quality products. Currently, we are offering custom-made traditional Muay Thai shorts, high quality organic blend t-shirts, warm up hoodies and sweat pants, Flexfit hats, gloves, shin guards and traditional Prajioud arm bands. They also offer sizing to cater to women and youth. The Evolution of Fight Gear! Ring to Cage Fight Gear is a premium line of Boxing, Muay Thai, and MMA gear. These products feature the latest designs manufactured to exact specifications and have received excellent reviews from athletes and coaches across the country. Yes, they look good but wait until you try them. You will be amazed by these products! knew what fighters from past World Classic's needed... Professional video footage of their bouts. SHRADER MEDIA will be offering video services to the fighters during this event and will have various DVD's for sale at their booth. TRADITIONZ T-Shirts are a new line of T's that are sweeping the Martial Arts World! IKF is a proud endorser of this product and not only do they have some great looking designs, they are without a doubt, one of the most comfortable T's you will ever wear! Don "THE DRAGON" Wilson will be here too and in fact the new "Muay Thai" shirt will make its debut here. Check out the quality of their shirts and do not forget to have the Dragon sign yours! As a Professional Kickboxer, Don "THE DRAGON" Wilson won 11 World Titles with several Sanctioning bodies that included the IKF, WKA, KICK, ISKA, STAR and the PKO. Never backing down from a challenge, Don has fought champions all around the world, in Hong Kong, Japan, Italy, Canada, Germany, Great Britain, Thailand, Las Vegas and countless other locations. His fight record is 71 wins, 5 loses and 2 draws with 47 wins coming by the Knockout. He has been regarded as one of the greatest kickboxer of all time. 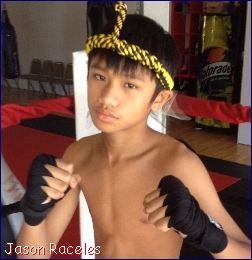 Up and coming Amateur Kickboxers will get a chance to rub shoulders with him all weekend long because he will be "In The House" at the 2012 IKF World Classic Amateur Championship Tournament! For more info about "The Dragon" click HERE! If you have not heard about Wintensity by now, you better start doing your homework. This course has been sponsored by the IKF and International Fight Sports and is free to everyone who pre-registers, so there is no reason you should miss it. The seminar training provided by Wintensity is designed to help martial artists gain a greater understanding of necessary mental preparation for any physical conflict, including competitive fighting. Wintensity was created by former IKF World Classic Tournament Champion Eric Parker. Eric began training in the martial arts at age six, and is now 40 years old. With 34 years of continuous martial arts training, he still trains and teaches Muay Thai every day and trains in JiuJitsu several days every week. He retired this year from competitive Muay Thai kickboxing with an official record of 12-0 (7 wins by KO). 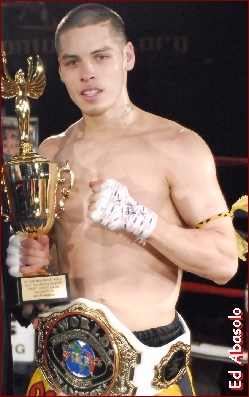 Eric was the first fighter to win "4" straight IKF World Classic Tournament bouts by TKO/KO on his way to winning the 2009 IKF World Classic Muay Thai Lightweight Amateur Title. He won his Championship bout at 48 seconds of round 1 with a Spinning Hook Kick after he defeated all 3 of his previous opponents by TKO in what was the largest fighter bracket of the tournament. Now retired, he is also a former ISKA United States Light-Welterweight Amateur Champion, and ISKA Florida State Light-Welterweight Amateur Champion. After serving in the Marine Corps, Eric entered the field of Law Enforcement where he first worked as a communications officer for three years, and then served for ten years as a street patrol officer, a K9 officer, and a special operations police officer. During his time in Law Enforcement, Eric was a SWAT Team Member for eight years, and a SWAT Team Section Leader/SWAT Instructor for six years. Eric was also assigned for five years as a patrol K9 Handler. In May of 1999, Eric was wounded during a shoot-out while serving as a SWAT Team member and executing a high-risk narcotics search warrant. These events, along with specific education in the anatomy and physiology of the human brain and the impact of critical stress upon physical performance, have laid the foundation for his passion for training in this environment. Eric has a B.S. in Psychology with a continuing education focus on Post Traumatic Stress Disorder and cognitive processes. "MANDATORY RULES AND WELCOME MEETING"
SPECIAL ANNOUNCEMENTS REGARDING TOURNAMENT RULES, REGULATIONS, SCHEDULE, ETC. 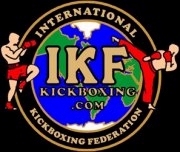 2012 IKF World Classic Kickboxing Championships? Do you know about the condensed, ONE-HOUR, super intense, down-n-dirty, jammed, compacted, FREE Wintensity Seminar to be held immediately following the Welcome & Rules Meeting on Friday evening? See the IKF Championship Schedule by clicking HERE! It helps to know how many to expect, so... Please Pre-Register for the FREE Seminar by clicking HERE! Wintensity founder and seminar leader Eric Parker has no problem with anyone EATING or DRINKING during the seminar! Which is why we have the room set up "Classroom Style" with chairs and tables for everyone. Cool Techniques in "Psychological Warfare"
Learn to Make Better Decisions "Under Pressure"
Seminars Now Available "LIVE" and on DVD or Online! Parker defeated all 3 of his previous opponents by TKO as he worked his way through one of the largest fighter bracket of the tournament. Parker won his Championship bout at 48 seconds of round 1! PAK 5 "Stand Up And Fight!" Defeated Richard Holland, (Fresno, CA, USA, 0-2,154, 5'9", 8/11/80, Michelle Correa (559)-916-2925) By TKO at 1:17 of round 2. Richard Holland was issued a 45 day suspension from the ring-side Doctor. Defeated Tim Eastom, (Fresno, CA, USA, 0-1, 168, 5'9", 8/12/77, Jason Von Flue (805)-431-7376) by Unanimous Decision, 30-26, 29-27, 29-28. Zach Bunnell was awarded fighter of the night and his trainer was given a $250 bonus. defeated Mathew Munguia (Fresno, CA, USA, 0-1, 142, 5'7", 10/28/92, Keo Sychanthavong (559)-355-2622) by unanimous decision, 30-27, 29-28, 29-28.
defeated Memo Vasquez (Reno, NV, USA, 0-1,203, 6'2",6/25/80, Casey Backenbush (775)-560-0059) By Split decision 29-28, 29-28, 28-29. Defeated Nick Bustamonte (Fresno, CA, USA, 0-1, 179, 5'9", 9/27/84, Noro Aristakesyan (559)-940-0861) by Split Decision, 30-27, 30-27, 28-29. Defeated Tanner Marlowe (Bakersfield, CA, USA. 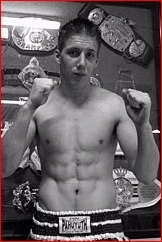 2-1, 6'2", 189, 7/19/92, Eric Nolan (661)-833-3367) by split decision, 30-27, 29-28, 27-30.
defeated Marciel Cypian (Bakersfield, CA, USA, 2-1, 146, 5'9", 7/30/90 Eric Nolan (661)-833-3367) by Unanimous Decision 30-27, 30-27, 30-27. 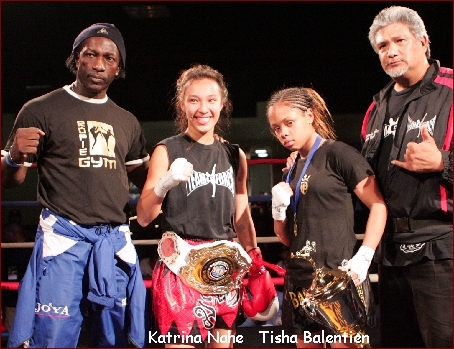 Jolie Tally (Judgement Kickboxing) defeated Katie Ramirez (Rosales Kickboxing) by split decision. Damy Amezcua (Fight Club) defeated Makayla Gallegos (Rosales Kickboxing) by unanimous decision. Angel Rivas (Fight Club) defeated Patrick Heinemeyer (Rosales Kickboxing) by 2nd round TKO. Tasha Tenbrink (Rosales Kickboxing) defeated Mercedes Gonzales (Albuquerque Kenpo) by unanimous decision. Bryanna Otero (Rosales Kickboxing) defeated Amanda Lovato (Judgment Kickboxing) by unanimous decision. Dorian Dixon (Rosales Kickboxing) defeated Adam Mendez (Fight Club) by TKO in the 1st round. Due to our 2012 IKF World Classic Amateur Kickboxing & Muay Thai Championships in Orlando Florida The International Fight Sports offices will be closed from Friday, July 13th until Tuesday evening, July 17th. Tuesday evening July 17th, we will have our offices set up in Orlando Florida for the Tournament. Any e-mails will also be returned after Tuesday, July 17th. Around 4:PM today, IKF President Steve Fossum and IKF Photographer Glenn Berg will be leaving IKF Headquarters in Newcastle, California for the 3,000 mile journey to Orlando. The two will drive to Omaha Nebraska where they will stop for a break and meet with IKF World Ambassador Brooks Mason. Brooks will travel with them to Orlando. They hope to arrive in Orlando sometime Late Monday, July 16th. 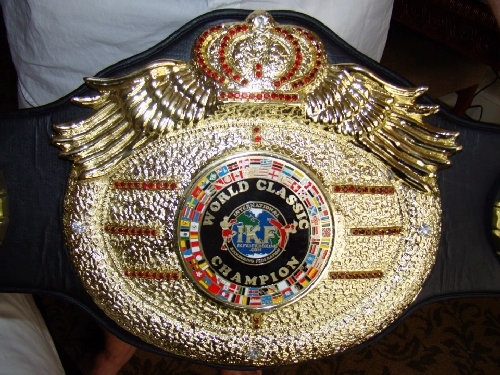 For more info on the 2012 IKF World Classic Amateur Kickboxing & Muay Thai Championships, click HERE. Thank you and we hope to see you in Orlando! So WHY do they DRIVE to this event every year? Well, in 2000, the second year of the event, the shipping company (UPS) who was also their shipping sponsor, lost all the tournament title belts. It was at that time when Fossum made the promise, "No fighter will ever again go home without his or her belt, and I will personally make sure all the Title belts get to the event." He's kept his promise. Starting in 2001, he has driven to every IKF Tournament ever held. (**) The above Anthony Hernandez is not this MMA Fighter Anthony Hernandez who is 8-0. WHAT: IKF Muay Thai, International Low and Hi Kick Styles: Men, Women and Children - Semi-Contact - No Knockouts! IKF Amateur K1 Rules European Lightweight Title. WINNER: Howard Hogg by KO at 1.59 of Round 4. Full contact star Howard Hogg showed that he has a future is in K1 and International rules with a dominant performance against the highly rated French champion Jeremy DeCuyper. The Frenchman came looking for an early finish with strong low kicks and punch combinations. However Hogg was quickly into his stride, delivering blistering punch combinations that had DeCuyper off balance and taking punishment throughout. At times Hogg looked to have a little trouble with his range but this was quickly rectified as he stepped up a gear with each round that passed. There was very little knee work as both men were content to stand and trade punches and low kicks. This was one of these trade off's that signalled the beginning of the end towards the latter part of the 4th round. DeCuyper was well behind and looking for the KO when he walked into 4 solid shots that sent him down for a count. He was up at 6 but quickly returned after another barrage. Up again more slowly this time he desperately tried to see the round out but Hogg caught him with a final combination right on the bell and it was all over. The Welshman is a true force to be reckoned with under this rule set and this was a well deserved win! WINNER: Daniel Thomas by unanimous decision 30-28, 29-28, 29-28. WINNER: Jason Bradley by TKO at 1:28 of round 1. Ray Weeks receives 30 day medical suspension until 7th August. WINNER: Dan Tyas by KO at :57 seconds of round 2. Martin Jones receives 45 day medical suspension until 22nd August. WINNER: Josh Ellis by split decision 28-29, 30-27, 30-27. WINNER: Gavin Charnock by Rear Naked Choke Submission at 1:48 of round 1. WINNER: Rowland Lee by split decision 28-29, 30-27, 30-27. WINNER: Kristian Hayes by split decision 28-30, 30-27, 30-28. WINNER: Owain Ap Gwyn by Kimura Submission at 0:33 of round 1. WINNER: Gareth Penny by TKO (Ground & Pound) at 4:14 of round 1. Shane Riley receives 30 day medical suspension until 7th August. WINNER: Eric Cebarec by Ground & Pound 2:01 Round 1. Mike Edwards receives 30 day medical suspension until 7th August, 2012. 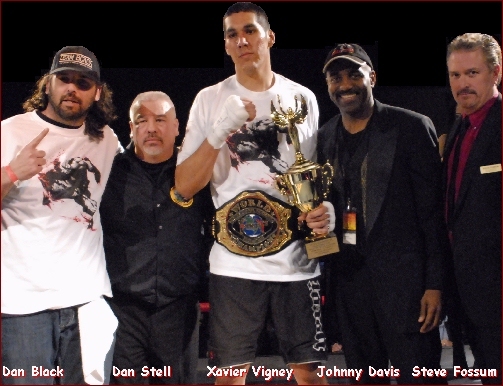 June 29th, 2012 marked Johnny Davis' (Right) - AK Promotions' "37th" Amateur Kickboxing event... "37". However, it's the last 17-18 events he will be most remembered for! As with the previous 17 events, this one was no less filled with lights, cameras and plenty of exciting Muay Thai Kickboxing ACTION! 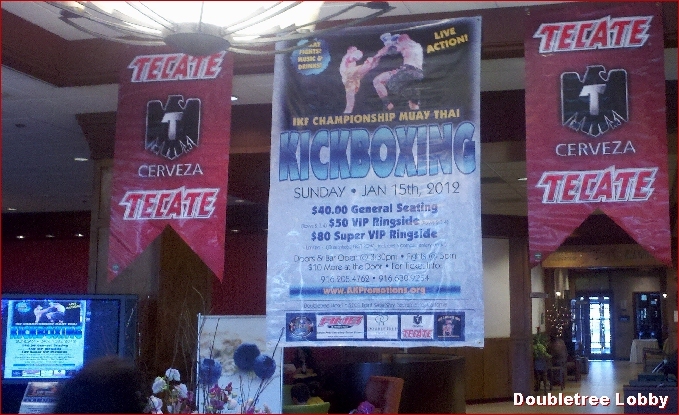 A good size crowd saw 11 exciting bouts at the Doubletree Hotel Ballroom in Sacramento. Three of which were IKF title bouts. One of course was the one many had been wanting to see since the end of the 2011 IKF West Coast Classic (WCC). A Rematch of the WCC Championship bout between WCC Champion and current IKF World Champion Ed Abasolo and challenger Aleksandar Naumoski as the Main event of the night for Abasolo's first defense of his IKF Light Middleweight World Title. Abasolo won the title on January 15th, 2012 in Sacramento, California, USA when he defeated Damien Earl of Phoenix, Arizona, USA, (12-2/5) by TKO at 1:04 of round 5. This is one of those times when two challengers meet who are from the same state, but BOTH, TRULY deserving of the World title shot. Unlike other promotions or so called "Sanctioned" title fights, this bout was justified by the ONLY Amateur Muay Thai Kickboxing rankings in the world, the IKF World Amateur Rankings. Abasolo and Naumoski are ranked in the IKF Amateur Men's Muay Thai Rules World Rankings. There were two fighters ranked ahead of Naumoski, 2011 IKF World Classic Champion Nathan Key (Actually, 4 Time WC Champion) of Augusta, Georgia, USA (29-2/15) and IKF Intercontinental Champion Peter Arbeau of Calgary, Alberta, Canada (29-9-1/5). Davis and the IKF went through the official process of determining Abasolo's challenger. Key was contacted first, but he was already scheduled to challenge for yet "Another" IKF World Classic Title on July 20, 21 & 22 in Orlando Florida so he couldn't take the bout and opted in hopes of fighting the eventual winner later down the line. Arbeau, like several of trainer Mike Miles' champion Fighters was booked for several top bouts through the summer so he couldn't take the fight at this time either. 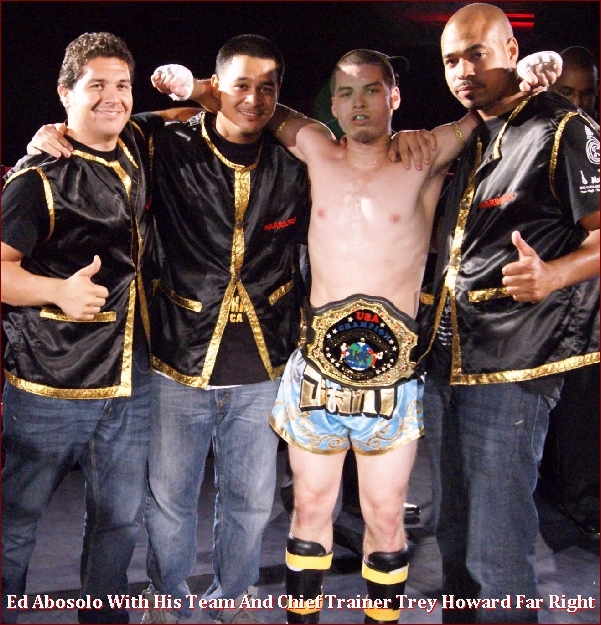 As we have already said, this was the first defense for current IKF World Champion Ed Abasolo of Benicia, California, USA (*9-0/3, 158.6, 5'10", 10-25-86, Trey Howard) IKF Amateur World "FULL" Muay Thai Rules Light Middleweight World Title against Aleksandar Naumoski of San Jose, California, USA (*9-5/1, 159, 5'9", 4-2-80, Derek Yuen) for a scheduled 5 rounds. (*) Records BEFORE this bout. As round two came to an end, Naumoski caught Abasolo with a "SHOT" of a right hand that landed EXACTLY at the bell. The shot CLEARLY rocked Abasolo, something we had never seen before. Legs wobbly, he made it back to his corner, but it was clear to everyone that if there was ever a definition of being "Saved by the Bell", this was indeed one of them. Round 3 started with Naumoski acting like a hungry wolf that smelled blood. He knew he had Abasolo hurt and he went after him. He landed yet more and more solid right hands and Abasolo continued to look anything but the relaxed and smooth fireball we all knew him as. All three judges gave round 3 to Naumoski. *Round 4 Both were clearly winded from nearly being beat to the canvas by each other up to this point. This round would surly be a survival of the fittest. It was also the most questioned round. Many we talked to at ringside and fight fans had it very close as round 4 started. Naumoski looked more tired than Abasolo in this round but he also seemed to be the more aggressive or at least seemed to be. Simply put, round 4 was close, but because Abasolo fought so much on the ropes, it most likely swayed the judges towards Naumoski. *Round 5 was where neither wanted to be. The 5th and final round of what now turned out to be a war between two Gladiators who were NOT going to give in! In round 5 though we saw a change in Abasolo. It was as though he was revived by his trainer in the corner and informed, he needed to step it up if he was going to win this fight. Although Naumoski was still firing, he now looked a little winded as it was Abasolo's turn to fire back some bug shots. This round was probably the most exciting round as each one had impressive moments of glory! Towards the later part of the round, Abasolo was landing uppercut after uppercut followed with some combinations. However it was the long uppercuts that were doing the damage on Naumoski. As round 4 was coming to an end many thought Naumoski could go down as Abasolo continued to land shot after shot. Like Abasolo found in round 2, the bell here truly saved Naumoski in this round. (*) 7-9-12: We apologize that we had these two rounds (4 & 5) mixed up. The round action is correct now. As the final bell rang, both warriors gave their respects while the crowd stood to their feet and praised them both for a GREAT FIGHT! One that was looking like it was going to be less exciting than their match in November, turned out to be a little more in different ways. As the scores were read, all 3 judges had it 49-47 for Naumoski (which meant they must have had at least 1, 10-10 round in there). 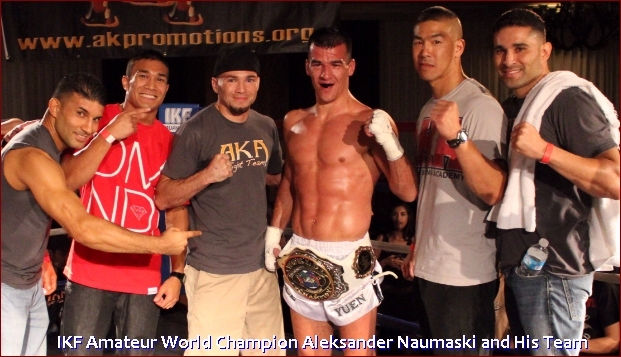 Aleksandar Naumoski of San Jose, California was crowned the New IKF World Champion on this night in a war among two Gladiators that are also two CLASS ACTS! 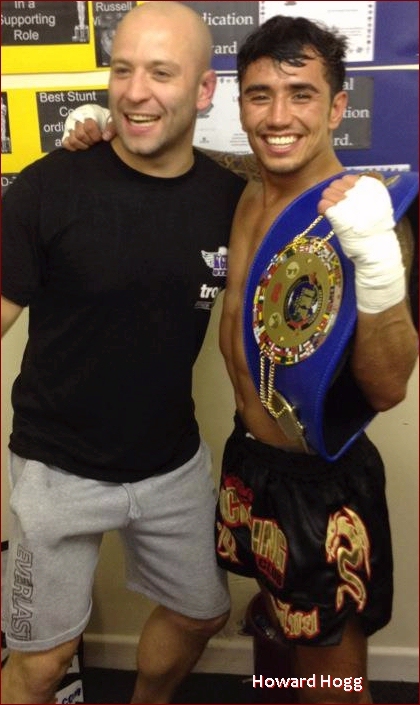 The IKF has been proud to have BOTH as IKF WORLD CHAMPIONS! Here are the results of all the remaining bouts below as detailed by our friends at QuestionableStoppage.com fight sport website. defeated Sebastian Dizon, (Union City, California, USA, 0-2, 129.8, 5'3", 4-14-93, Evan Esegura, (415) 740-7841) by unanimous decision, 29-28 on all 3 judges cards. QS Report: First fight of the night had Adam Smith taking on Sebastian Dezon at the 132 pound limit. Smith spent the entire fight moving forward, he pressed the action and controlled the pace of the fight. Dezon preferred to stay evasive, pick his shots, both punches and high kicks. Dezon made Smith a lot, but Smith's relentless attack and dogged pursuit was rewarded on the scorecards, with Smith claiming the win with scores of 29-28 on all three cards. defeated Raymond Cabanas, (Fresno, California, USA, 0-2, 147.4, 5'8", 12-12-93, James Contreras, (559) 346-7371) by unanimous decision, 30-27 on all 3 judges cards. QS Report: Next up we had a fight at 147 pounds as Carlos Galvan took on Raymond Cabanos. Galvan run his record up to 3-0 as he consistently picked Cabanos apart with high kicks and punch combos. Cabanos had little in reply and seemed to spend most of the fight back on his heals. Galvan takes the decision, 30-27 on all cards. QS Report: The Juniors got into the action next and Jordan Spears, 4'6" of fighting fury was able to edge out Sammy Sosa in a split decision, 29-28, 28-29 and 29-28.
defeated Dai Nguyen, (Las Vegas, Nevada, USA, 1-3/0, 135, 5'7", 5-25-84, Airr Phanthip, (702) 372-8088) by TKO at 1:32 of round 2. QS Report: Dai Nguyen of Las Vegas, NV took on Benjie Bernardino of Hayward. Bernardino proved to be the faster fighter, beating Nguyen to the punch and forcing the stoppage. Bernardino wins by TKO 1:32 of the second round. defeated Timothy Kamal, (San Jose, California, USA, 2-3, 163.8, 5'8", 6-3-88, Eddie Cole, (530) 354-0361) by unanimous decision, 29-28, 29-28 & 30-26. QS Report: Timothy Kamal took on Harley Maldonaldo at the 165 lbs class. Maldonaldo won this one throwing a variety of snappy kicks and landing hooks to the head of Kamal. Kamal would charge in, bull-who-sees-red style, but would never do more than hug and clench one he got there. Maldonaldo wins by scores of 29-28, 29-28 and 30-26.
defeated Jason Raceles (Sacramento, California, USA, 3-1 (S: 15-4) 94.6, 5'3", 4-9-99, Paul Matsumoto, (415) 516-8588) by unanimous decision, 29-28 on all 3 judges cards. QS Report: The Junior Cruiser-weight Title (that's 95 pounds) was up for grabs as Jason Raceles took on Juan Barajas in the kind of wild brawl one would expect from a pair of 13 year olds. 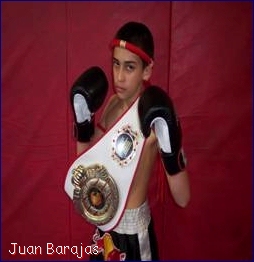 After three round of under-sized action, Juan Barajas takes all three cards, 29-28, and a shiny new belt, one of many I'm sure he'll get before he's done. QS Report: Murphy Grant and Carl Henderson matched up at 142 pounds. Henderson landed single punches to great effect all though the fight. He caught Grant moving forward repeatedly, knocking him down in the second round and battering him into a standing eight count in the third. Henderson wins on all cards, with scores of 29-26, 30-26 and 30-26.
defeated Aber Bouttavong, (West Sacramento, California, USA, 3-1/1, 125, 5'6", 10-26-92, Andy Khensamphaph, 916) 769-7434) by majority decision, 48-46, 48-46 & 47-47. 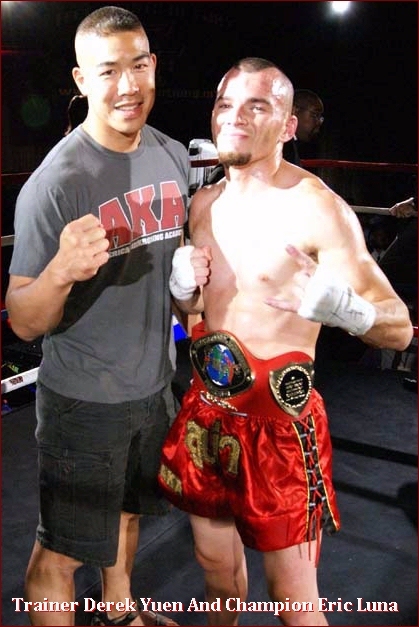 QS Report: The second title up for grabs Friday night was the IKF California Featherweight Belt, with Anthony Aurellio battling Aber Bouttavong for the honor. A contrast of style between to sound fighters Aurellio was light on his feet, staying mobile and looking to evade attacks, while Bouttavong was less mobile, almost still, blocking or simply shrugging off attacks before exploding into combos of his own. Bouttavong was able to put together the more convincing offense and claimed the majority decision and the belt, with scores of 48-46, 48-46, and 47-47.
defeated Cruz Montenegro, (Fresno, California, USA, 0-1, 134.4, 5'6", 8-20-85, Jaimes Contreras, (559) 346-7371) by unanimous decision 30-27, 29-28 & 29-28. QS Report: The last of junior-age bouts had Pete Hershelman, 15 taking on Cruz Montenegro, 16. A fast-paced, free-wheeling fight, with Montenegrro landing the 1-2 punch combo to go effect, while Hershelman scored with kicks at every level, high, low and body, and picked up bonus points for walking in to the theme from Mario Brothers. Hershelman takes it, 30-27 on one card and 29-28 on two more. defeated Andrew Capurro, (Oakland, California, USA, 2-3-1, 142.8, 5'8", 3-8-86, Mike Regnier, (510) 708, 5269) by split decision, 29-28, 29-28 & 28-29. QS Report: Both Raheem Davis and Andrew Capurro landed power shots in their fight, with Davis just edging out the split decision, 29-28, 28-29, and 29-28.
defeated **Ed Abasolo, (Benicia, California, USA 9-1/3, 158.6, 5'10", 10-25-86, Trey Howard, (707) 373-4125 ) by unanimous decision, 49-47 on all 3 judges cards. QS Report: The Main event of the night saw Ed Abasolo defending his IKF World Light Middleweight Title against Aleksandar Naumoski in a five round battle. This main event lived up to the hype as the two fighters battled in an absolute war. Abasolo dispense with his usual flash and show-boating, which would be simply too dangerous against a fight as tough as Naumoski. Abasolo chose to stand and trade with Naumoski and the two fighters traded leg kicks and punch combos. It was clear in the first three rounds that Naumoski was matching the champ, blow for blow and even giving better than he got. Naumoski's finest round was the fourth, he pinned Abasolo in the corner and battered about the head. But Naumoski seemed to tire in the fifth round and Abasolo stormed back, giving Naumoski a pretty good beating of his own. But Abasolo could get the finish and was behind too far from earlier round to catch up. The judges score it 49-47 for Naumoski on all three cards. Naumoski is your winner and new World Champion. IKF head Steve Fossum spoke of an Abasolo-Naumoski rematch, which QS heartily endorses. If that fight happens, you will hear about it here on Questionable Stoppage first. Thanks for reading fight fans. "You Don't Know What You Have Until It's Gone..."
The Missed Opportunity Of This Great Sport! 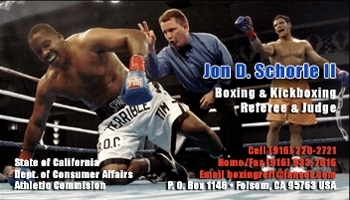 As we noted above, There was a time when Johnny Davis (Right) first started promoting Kickboxing here in Northern California that featured shows like most Amateur Promotions... School Gymnasiums, Rec. Centers even Kickboxing Gyms. As each promotion past, no one really took notice because they were basically the same as other Amateur events. However, a few years ago, Davis changed paths and did what few, if any amateur promoters do in todays amateur fight sports... He KICKED It UP! Davis on the other hand reached deep into his pockets and stopped doing the gymnasium, small club venue shows and started booking beautiful ballrooms for his events. Instead of a fully lit room that appeared like a karate tournament, he paid for ring lighting to center stage the ring. This ONE thing alone brings ANY Promotion up 10 Fold! He added spotlights, colored lights, better DJ, video crew, and the list goes on and on... And for the most part, people responded, with Enthusiasm! "No one from our team has ever fought on an event like this." said one trainer at Davis' last event. "We last fought in a tiny bar where you could hardly make it to the ring. This is like the stage of a Pro fight!" However, this wasn't all Davis did. He was also an excellent matchmaker! Look at the number of "Decisions" on his last 10 events. Decisions often show close, well matched bouts, where as quick stoppages show the other. Davis also stepped up his exposure too. Of course he added the basic radio spots, even some TV spots. However, he even dug deeper into his pockets to sanction a minimum of 3 Title bouts on nearly every event. He not only created new Champions, but he Promoted them as well! He made fighters and Champions on his events MORE than just fighters and made the Champions, well, REAL CHAMPIONS! Davis has brought in top contenders from all over the Western USA as well as the East Coast, and for one World Title bout, he went to HOLLAND to bring in the "BEST" to fight a local top contender for an IKF World Title. "HE PROMOTED FIGHTERS AND THE SPORT!" On July 6th Davis announced he was taking a break from the fight promotions business. "I wanted to take a moment to say thanks to everyone who has supported AK Promotions'..Live IKF Muay Thai Kickboxing events and, or who was a fighter, trainer, spectator or vendor etc. with my company in the State of CA." said Davis. Davis gave several reasons for this decision of a break. Some of course surrounded the rising cost of promoting Amateur events in the State of California. With state commission insurance requirements of $50,000 (The highest in the nation for an AMATEUR event) the cost of insurance alone was a major dip into potential profits of any promoters events, and the reality is, if your in business, you have to make a profit to survive. "I HATE to hear a fighter, trainer or anyone say, 'Oh that promoter is making a ton of money off me!'" Says IKF President Steve Fossum. "The reality is, I would hope EVERY promoter makes a ZILLION in profits. Otherwise, if they are not making money, they are not successful, and why would anyone want to be an unsuccessful promoter? That just leads to a road of failure and without promoters, NONE of us would be needed, trainers, fighters, officials and of course Sanctioning Bodies! Promoters provide an opportunity and a stage for us all, and without them, we don't have a sport. Imagine an NFL Team with no team owners... Get the point? Without Promoters like Johnny Davis, where will our sport go?" In the past few years AKP has promoted some of the best Amateur Muay Thai Kickboxing events in the nation. They stepped up the level of exposure of the sport through forms of media from the IKF website with their many press releases about their events to Facebook as well as YouTube videos both before and after their events. 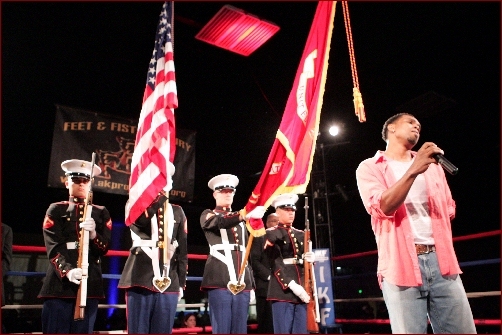 Although taking a break from promoting, Davis will still be involved at some level in the sport of Kickboxing with his gym in Rocklin California and of course as his role of President of the IKF's "Point Kickboxing" (www.IKFPKB.com) division. IKF Point Muay Thai Kickboxing is a creation of Davis' and although it has been copied illegally (The name "POINT" Kickboxing) by others here in the State as well as around the globe, Davis himself founded the actual name of "POINT" Kickboxing. Davis as well as the IKF agree that the sport deserves better opportunities for its athletes and getting it to that next level, without proper sponsorship or a group such as Station Casino's AND Zuffa, LLC owned by Frank and Lorenzo Fertitta (The backers behind UFC MMA) just isn't possible. Few know that UFC was in the red over $50 million dollars before UFC signed the well known SPIKE TV deal that skyrocketed MMA to it's modern day popularity and financial success. "If you took AK Promotions for example, and the work of the IKF, this is a sport set and ready for major sponsorship and TV." Says Fossum. "We hear daily how people are more and more excited about the stand-up fighting such as Muay Thai Kickboxing as compared to the grappling game." What this sport is missing is more "REAL" Promoters who take the same pride in their work as AK Promotions has over the years. 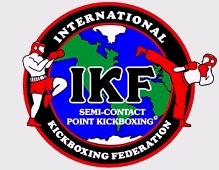 The sport is here and organized with all the IKF has done with their website. Current Event info, news and the only internet Muay Thai Kickboxing Rankings in the world for Amateur and Professional Muay Thai Kickboxing. The IKF has also built up the IKF website to be the most actively visited Muay Thai Kickboxing website in the world (See Traffic Reports by Alexa.com) When someone makes the news or rankings or their event gets posted as an IKF event, it's being viewed by millions of Muay Thai Kickboxing fighters, trainers, officials and fight fans around the world, not just IKF associated people. AK Promotions was doing it right, like no other Amateur Muay Thai Kickboxing Promoter has EVER done! The biggest reason for their popularity and success was they were CONSISTENT! They didn't do 2-3 shows a year for the fun of it. They treated it as a professional business promoting the fighters as well as the SPORT! Over the years they gave fighters not only in California, but from around the world an opportunity to showcase their skills on a stage worthy of such talents. 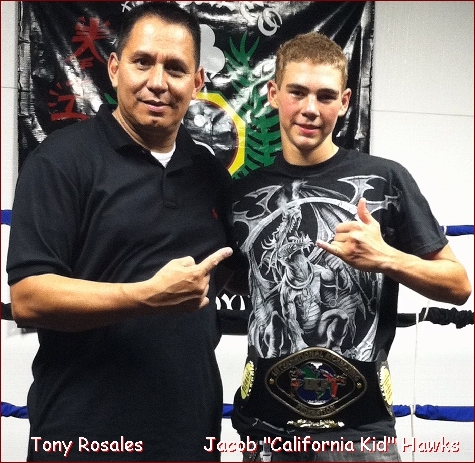 WHO will pick up the torch and carry it now For Amateur Muay Thai Kickboxers on The West Coast? The "Mayhem In The Menlo" Kickboxing tournament in the Menlo Park Hotel this past Saturday evening was a huge success for the host club Galway Black Dragon. 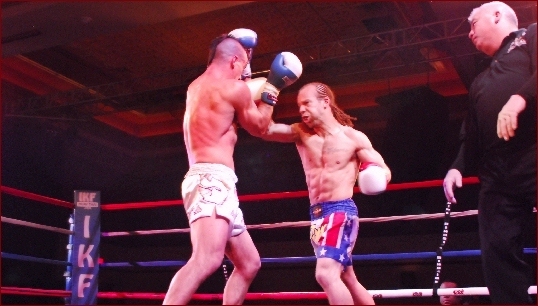 The event featured no less than four different rule styles and it attracted fighters from all corners of the country. 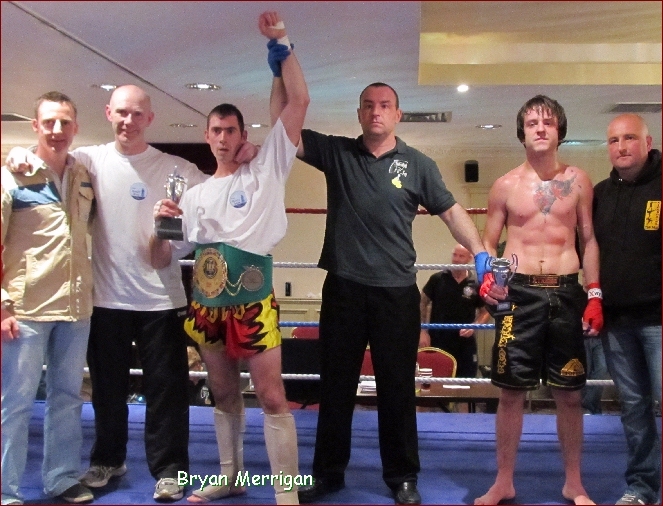 Also, a little piece of martial arts history was made by Oughterard fighter Bryan "Mayhem" Merrigan as he became the first man ever to capture an IKF Sanctioned All Ireland K-1 title when he defeated teak tough Tomas Trajkovski from the Top Pro gym in Kilkenny. 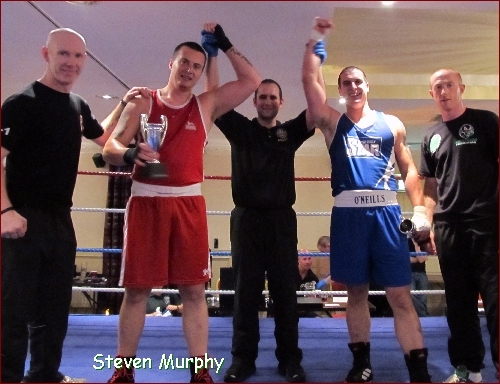 The fight, which was kindly sponsored by the Boat Inn Pub in Oughterard, went the distance and was a gruelling encounter that left both men battered & bruised. In the end it was Merrigan that caught the judges eyes and he was declared a unanimous winner after the five round battle. Bryan now has the distinction of holding two versions of the IKF Super Middleweight Title concurrently as he also won the International Rules version earlier this year by first round stoppage. Tommy Delaney from Moluntmellick was due to fight Steven Mc Afee from Dublin in an Eliminator bout to see who would go forward to take on No. 1 seed Dylan Moran on August 25th in Ashbourne, Co. Meath for the vacant IKF AM FCR All Ireland Light Welterweight Title. However Mc Afee failed to make weight so Delaney automatically goes through. Apart from the main event, there was another ten exciting undercard bouts under various rules which kept everyone entertained. The show once again attracted a full house of enthusiastic fight fans and finger food was served throughout the night and the show was completed by 10.30PM. 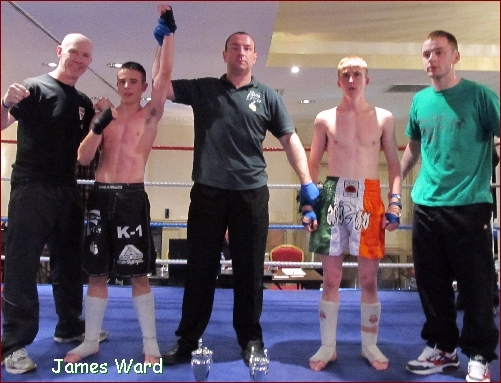 defeated Dylan Casey, (Galway, Ireland, 2-5-1, 62kg, 6', 01-30-95, Pete Foley 087 8119227) by TKO in round two. Dylan Casey has been given a 45 day medical suspension until 14th August, 2012.
defeated Adam Pieczarka, (Dublin, Ireland, 2-2, 70.7kg, 168cm, 04-18-82, Glen Heenan 086 3993095) by TKO in round one. Adam Pieczarka has been given a 30 day medical suspension until 30th July, 2012.
defeated Andrew Grogan, (Athlone, Ireland, 2-2, 58.6kg, 5'10'', 02-20-96, Aaron Mc Grath 085 1328205) by decision, 28-28, 28-28, 29-28.
and Christina Mc Mahon, (Monaghan, Ireland, Experienced Kickboxer, 10-0 Boxing, 61.4kg, 5'3'', 06-18-74, Martin "Frick" Mc Mahon 087 2550505) fought to a draw in an exibition match under conventional boxing rules. defeated Keith Shelly, (Dublin, Ireland, 5-6, 82.2kg, 5'10'', 10-05-75, Jonathan Lewins 086 8482752) by decision (30-27, 29-28, 29-27.
defeated Alan Moore, (0-1, 51.8kg, 5'7'', 11-25-95, Eileen O Driscoll 085 8877426) by Knockout in the 2nd round. Alan Moore has been given a 45 day medical suspension until 14th August, 2012.
and Martin Hickey, (0-1-1, 73.5kg, 5'10, 07-11-85, Aaron Mc Grath 085 1328205) fought toa majority draw, 28-29, 28-28, 28-27. Hickeys original opponent failed to make weight so Murray, who hadn't trained for 6 months due to exams, stepped in on 3 hours notice to make sure Hickey got a match. defeated Carle Dimycia, (Limerick, Ireland, 3-2, 69kg, 6'1'', Eddie Moloney 087 1435410) by TKO in round two. Carl Dimycia has been given a 30 day medical suspension until 30th July, 2012.
defeated Martin Ward, (0-2, 93.5kg, 6'1'', 10-07-86, Aaron Mc Grath 085 1328205) by decision, 28-28, 29-27, 29-28.
defeated Damian Darker, (Dublin, Ireland, 10-3, 72kg, 6'1'', 06-19-92, Glen Heenan 086 3993095) by TKO in round four. Damian Darker has been given a 30 day medical suspension until 30th July, 2012.
defeated Tomas Trajkovski, (Kilkenny, Ireland, 6-1, AB: 2-2-1, 68kg, 178cm, Paul Murphy, 087 2113516) by unanimous decision, 49-45, 49-45, 49-47. The next big IKF show in Galway is scheduled for 22nd September in the fantastic Black Box Theatre when Irelands top 70 kg full contact kickboxer Gary "Slick" Manogue will take on a top ranked German fighter for the vacant IKF AM FCR European Super Welterweight Title. There will be no less than five All Ireland Title fights on the mouth watering undercard including a Muay Thai Title and several back up bouts. So watch this space. Just two months later on November 24th, Irelands most well known K-1 fighter Aidan Brooks will headline at the Black Box Theatre when he fights for the IKF Professional World Light Heavyweight International Rules Title! (leg kicks) Over "10 rounds of pain!" The undercard will be an International Team event with the cream of Irish fighters taking a select team from overseas. LOADS OF IKF NEWS COMING FRIDAY! LAST WEEKENDS RESULTS - THIS WEEKENDS ACTION & 2012 WC UPDATES! Winner: Josh Rutgers Unanimous Decision- 30-27, 29-28, 30-27. Winner Christian Erkelens: Split Decision 29-28, 29-28, 28-29. Winner: Perry Hayes KO at 18 seconds of round 1. Winner: Nick Stiles: Corner Stoppage at the end of round 1 due to injured elbow. Winner: Carlos Serrub: Split Decision judges scores: 30-27, 29-28, 28-29. Winner: Jay Presley TKO at 1:15 of round 3. Rock Myrthil received a 30 day suspension until July 30, 2012.